Late last year I had the unpleasant experience of having one of my card designs copied by a previous company I worked with called Central23. This relatively new company is still advertising for illustrators to work with them, so I thought it would be best to give other fellow artists a warning. If you've been following my artwork for a while, you'll know that I produce my own illustrated greetings cards and sell them on my online shop, www.happyrose.etsy.com . 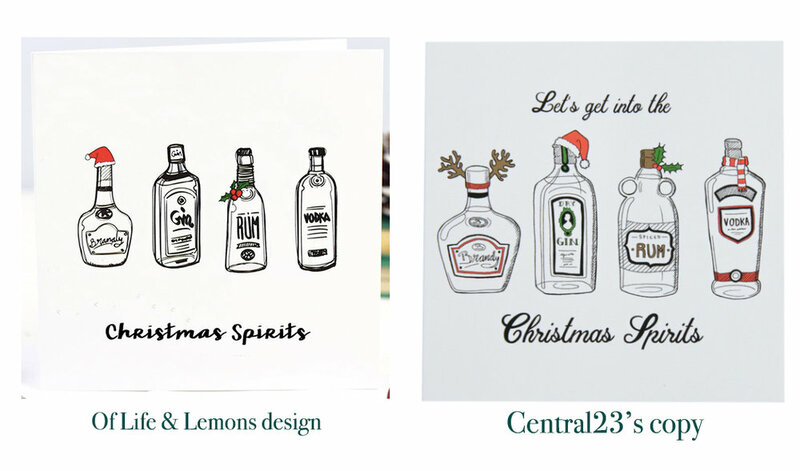 I've always been open in working with other greetings cards companies, so when I saw Central23 advertising for illustrators I thought this would be a good opportunity. Their work advertised on the website had a similar theme to mine (pop culture based/cheeky sense of humour) so i thought it would be a good fit. The owner of the company invited me for a meeting to discuss what they were looking for and show me examples of their work and the direction they are going. In the meeting he showed me interaction with other illustrators he works with. The emails were full of screenshots and images taken from Google/Pinterest/Etsy of other artists work. I didn't see any sketches and original ideas or designs from the artists themselves. I understand that companies and illustrators rely on inspiration boards to show upcoming trends, but a lot of these should be balanced with original sketches and designs from themselves. Looking back I should have listened to my intuition, but instead I only submitted my own sketches of card designs, based around the trends they wanted illustrations for (Gin/Sloth,etc). They bought a couple of these designs and that was that. Step forward to Taylor Swift bringing out her first single from her latest album, Reputation, I decided to make a Christmas card design inspired by her lyrics - 'I've Got A List Of Names And Yours Is In Red, Underlined'.. This reminded me of the song 'He's Making A List, He's Checking It Twice'. and so i came up with my own card design based on these two. I went down the pop culture hole that had all of swifts people she had conflict with (this was a big list, at least 50 names I wrote down). I picked 6 of those names from the list that fit in the scroll I drew up, and highlighted Katy's name (I nearly went for Kanye, as his name seemed to cropped up more). I also added the holly and santa hat, to give it more of a Christmas vibe. Before I produced cards in October, I made sure to research thoroughly on Google/Pinterest and Etsy to make sure no one else had this concept or design. Nothing remotely similar was out there, so I popped these cards on my Etsy shop on November 4th. These cards were a lot popular than I thought, and I completely sold out by December 6th. 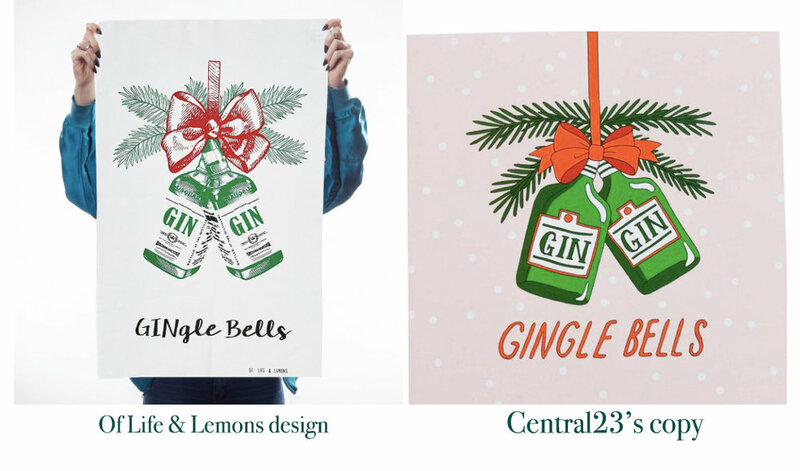 One week after I sold out, Central23 decided to copy my card design word for word and pop it on their shop on Etsy and their website. Instead of changing the design, they included the exact names, highlighting the same one I picked. Even the holly, the santa hat, everything was copied. The only thing they altered was what she was wearing. After getting some useful guidance from The AOI, they persuaded me to contact the company, asking them to take down the listing and payment fee for the card design. The owner sent back an insulting reply with the words 'frankly I don't care' in response to the card design theft. The email reply was childlike, an alternate appearance to the first impressions he gave me in the meeting. After reading this reply I looked again on their website. I noticed that this is not just a one off - I spotted a couple of the designs elsewhere, including these two designs by the company Of Life & Lemons. The 'Christmas Spirits' design is influence (they changed it enough so there wouldn't be copyright infringement). The second is an obvious rip, where the illustrator has copied the design, but in their own style. I want to emphasise that writing this blog post is not some kind of vendetta against this company, the only goal I want to happen is for companies like this to be mindful of where their designs come from. It all starts with the illustrators themselves. You may think this is a great opportunity to get some experience with a card company, but copying other artists designs won't get you anywhere in your career, other than a bad reputation and zero growth as an artist. Your also hurting those artists you've copied from - not only are you tracing the effort and time in their own original ideas, your also harming them financially. As a person that was commissioned by this company, then ripped off only a few months later, surely its obvious that they seem to not care about the artists they commission, or their reputation. We are all in the same boat at some point in our career, so lets stop making these companies think that working this way is ok. If you are an illustrator wanting to get into stationary design, I would research thoroughly the companies that you would like to work for. Based on my experience, the best companies are those that promote the artists that they work with. This could be a small thing, like mentioning their name on the cards featuring their illustration, or sharing their work via social media (with name tags). There are other wonderful greetings card companies out there that do fantastic work in sourcing new up and coming illustrators, coming up with original designs and from what I've found have had no conflicts with copyright infringement. Ohh Deer do a wonderful job at this, as well as WRAP, La La Land and so many others. All these companies have a section on their website where you can submit work. If your new at this then have a go at printing your own greetings cards and selling them online or in shops. Sometimes this is much more financially beneficial than having your card designs bought by another company. I do hope my experience has been beneficial for anyone thinking of starting a career in stationary design. If your just starting out and have any questions, don't hesitate to ask! 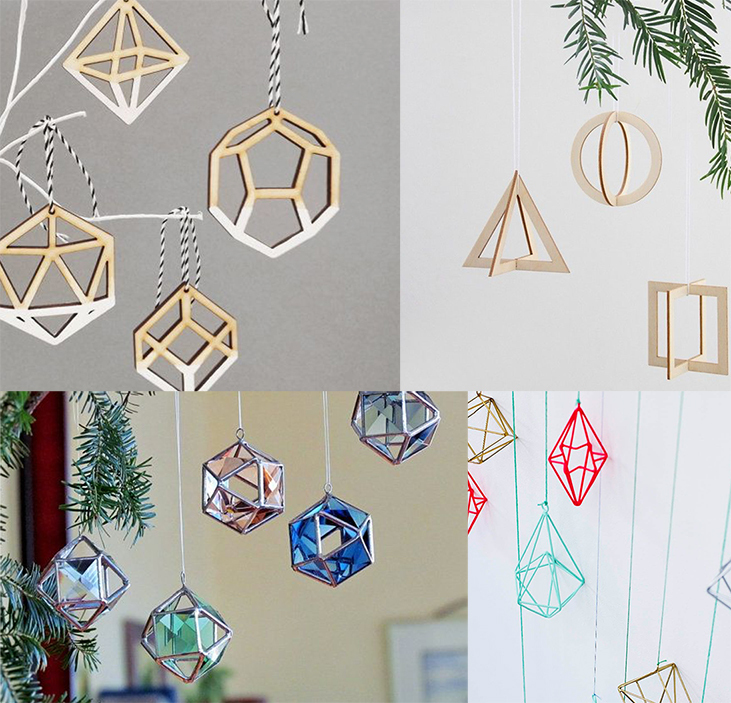 These geometric shapes are incredibly inspiring and beautiful. I love the clean cut angular lines and shadows they create. Inspired by the paper diamond shaped christmas tree decorations, which are incredibly on trend for 2017. I created this illustration in response to the paper creations. I loved the different tones on each angled corner. 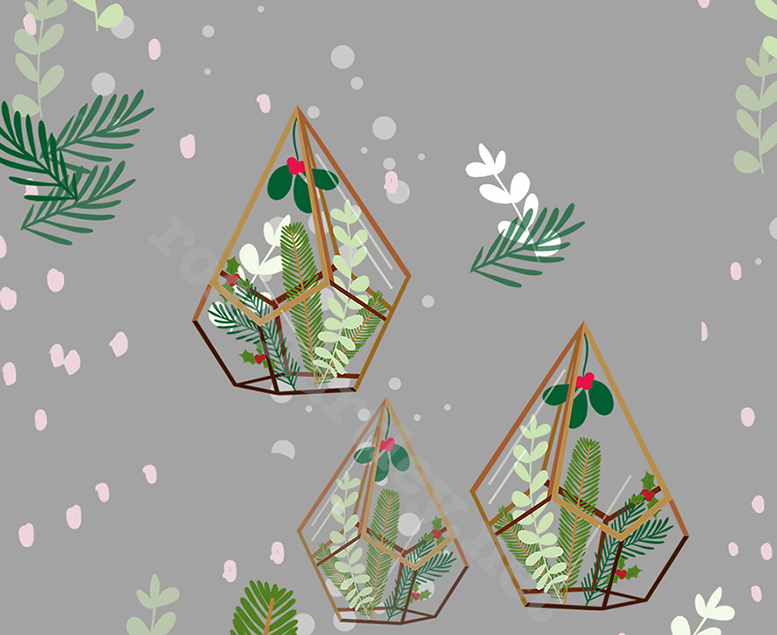 Another patterned illustration I created inspired by the geometric glass Terrarium's that are currently on trend, these housing christmas plants.